Just a month after the launch of the Kickstarter for Power of Grayskull: The Definitive History of He-Man and the Masters of the Universe, the fans have proven that they have the power by raising more than 200% of the campaign goal. Due to the overwhelming response, there will be a Special Edition Cut, only available to fans who pledge before the February 26 deadline. The film, from the teams who brought you Turtle Power and Nintendo Quest, will delve into the heart of 80’s nostalgia to find out once and for all #WhoHasThePower. Power of Grayskull, will, they say, be "the greatest, most definitive documentary on everything He-Man, Masters of the Universe and She-Ra, with everyone from writers, designers, artists, sculptors, show-runners, decision-makers and more on board." It will delve into the toys, comics, cartoons, and movies from all eras by talking to the people who helped make it a reality. Due to the remarkable response to the film’s Kickstarter, fans not only can pre-order the film but also have an option to receive Nintendo Quest and Turtle Power, in addition to securing exclusive Power of Grayskull rewards. including animation cels from the filmation cartoon and custom-made Masters of the Universe figures in the backers likeness, based on any era of toyline including She-Ra, and of course the significantly longer Special Edition Cut, which includes exclusive content that will never be offered again! Power of Grayskull: The Definitive History of He-Man and the Masters of the Universe will be directed by Randall Lobb and Rob McCallum, and produced by Randall Lobb, Rob McCallum, Isaac Elliott-Fisher, and Mark Hussey, under Definitive Films and will debut in 2017. 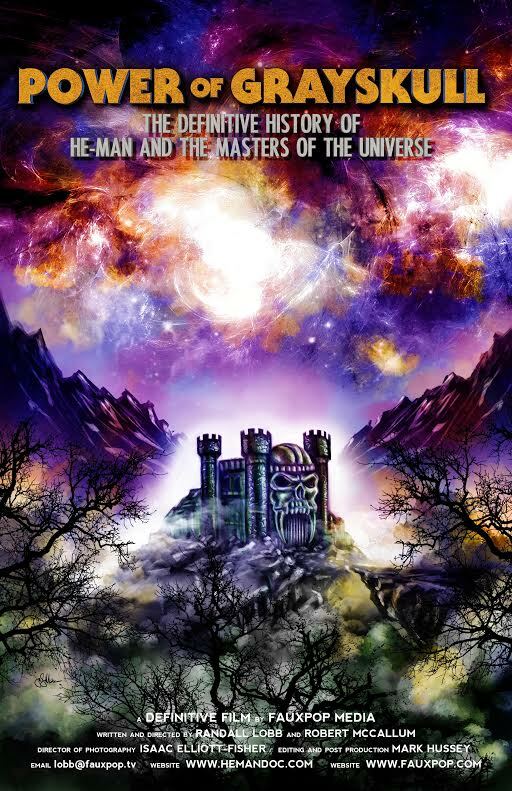 For more information visit www.HeManDoc.com and go support the kickstarter in its final few days.